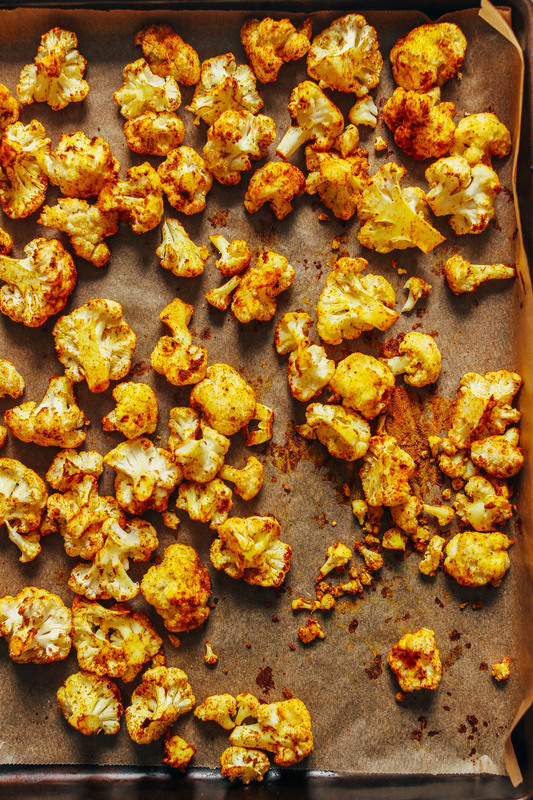 An easy, step-by-step tutorial for how to prepare, roast, and serve cauliflower! Cut cauliflower into large florets, and then chop into smaller bite-sized florets. Transfer to a mixing bowl and add oil, salt, and any other seasonings such as curry powder (optional). Toss to combine, and massage to get any seasonings into the grooves. Transfer to a baking sheet (parchment-lined or bare) and spread into an even layer. Bake for 25-40 minutes, tossing at the halfway point to ensure even baking, or until golden brown on the outside and tender on the inside. I prefer pretty browned cauliflower, so I like to cook it longer. Remove from oven and enjoy! Serve plain, or garnish with lemon, tahini, dried fruit, and cilantro (all optional). Store cooled leftovers in the refrigerator up to 4-5 days. Reheat on the stovetop in a skillet over medium heat, or in a 350 degree F (176 C) oven until hot. 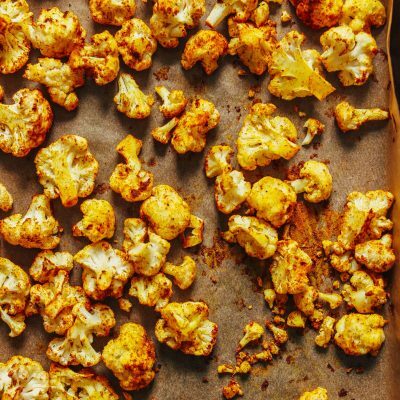 *Nutrition information is a rough estimate for 1 cup of cauliflower calculated with oil and seasonings, but without additional toppings. I love ur recipes! Can you do a vegan butter?? Thanks for the suggestion, Mona! We’ll add it to the recipe request list!